Chirag Desai is a young, zealous attorney with a bright future ahead of him. Chirag practices primarily in the areas of employment law and personal injury. His main areas of focus are; sexual harassment in the workplace, wrongful termination, and workplace discrimination/ retaliation claims. Chirag also routinely represents victims of car accidents and workplace accidents. He is great at earning the trust and respect of his clients and advocating passionately on behalf of them. Chirag is a May 2016, graduate of the West Virginia University College of Law. During his time in law school, Chirag realized his talent and passion for courtroom oral advocacy. He was selected on various trial teams to represent the WVU College of Law at national trial competitions. In his third year, Chirag practiced as a student attorney of the West Virginia University’s Clinical Law General Litigation program by providing free legal representation to indigent clients. Before joining our firm, Chirag worked for a small boutique law firm in Morgantown, WV, practicing in the areas of personal injury and employment law. During his time in practice, Chirag has provided his clients with quality legal representation, and achieved satisfactory results. 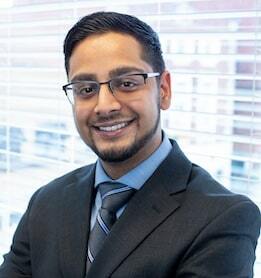 In his first full year of practice, Chirag recovered over $800,000.00 on behalf of his employment and personal injury clients and obtained an “Avvo 2018 Clients’ Choice Award.” Some of his achievements include multiple six-figure sexual harassment settlements and several six-figure car accident injury settlements. Outside of his law practice, Chirag enjoys travelling and adventuring with his girlfriend, Jenna, and their two dogs, Ava and Dez. We offer free, confidential case evaluations. WHAT DAMAGES CAN BE RECOVERED IN A PERSONAL INJURY CLAIM? Every situation is unique and, therefore, the damages that you may be able to recover after an accident can vary quite drastically. That being said, many people who have been injured as a result of someone else’s negligence find that they are entitled to compensation for certain damages. This compensation is meant to help unfairly injured victims obtain the treatment they need to move forward from the accident, free from undue financial strain. Furthermore, if your loved one was killed as a result of another person, company, or entity’s negligent actions, you may be able to recover damages such as medical treatment, funeral costs, loss of companionship, and more. For many, the legal process of filing and pursuing a personal injury claim is overwhelming. When you trust your case to the Clarksburg personal injury lawyers at Goddard & Wagoner, PLLC, we’ll handle every aspect of your recovery so that you can focus on getting the treatment and care you need. Our team offers personalized legal counsel and uncompromising representation. Whether we settle your case before trial or take on the negligent parties in litigation, you can rest assured that we will aggressively advocate for you and your rights. or filling out a contact form today. LEARN MORE ABOUT HOW WE'VE HELPED PEOPLE LIKE YOU. successfully obtain just settlements and verdicts throughout the state of West Virginia. Our proven track record of success speaks for itself. DON'T WAIT TO PURSUE THE COMPENSATION YOU DESERVE. The attorneys at Goddard & Wagoner, PLLC have worked on the other side and know how insurance companies work; they know how to stay ahead and get you the compensation you deserve.